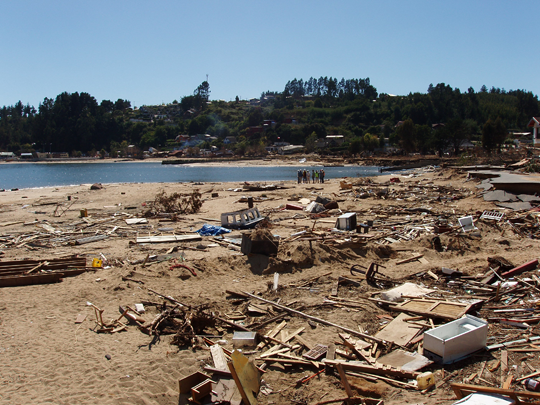 The 27 February 2010 Chilean earthquake generated a large transpacific tsunami and controversy as to what some have referred to as overly conservative warning issued for Hawaii and Japan. A rapid reconnaissance survey of the coastline of Chile and offshore islands of Santa Maria, Juan Fernandez and Easter, and the Marquesas in French Polynesia is under way with funding from the National Science Foundation and is being coordinated through UNESCO’s ITIC. The scientists are interviewing eyewitnesses to determine the local tsunami kinematics, i.e., polarity of the first arrival, interval between waves and which wave in the train was the largest- and the societal response. 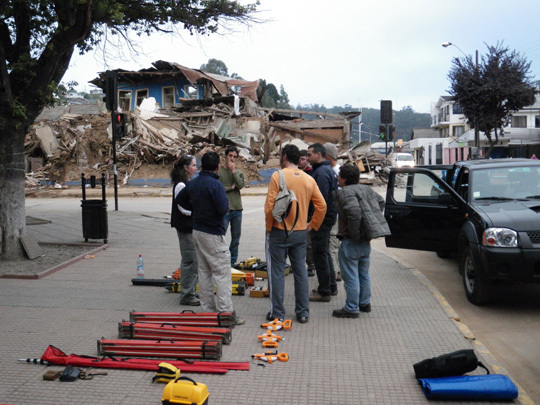 The team is measuring inundation distances and runup heights and will attempt to identify why the tsunami-related death toll in Chile is concentrated in a few specific locales. 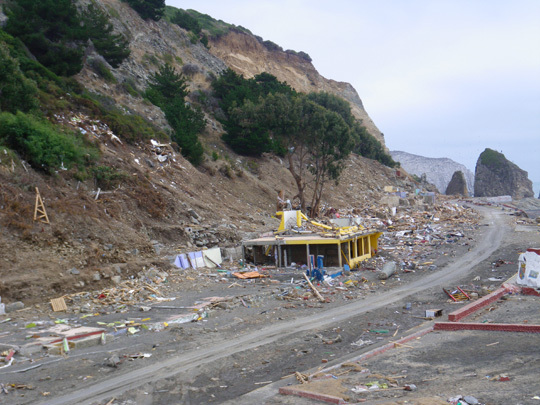 The questions that will be addresses is whether certain areas were tsunami traps and whether the observed runup height distribution around the Pacific was predictable, using existing numerical methods and forecast technology. The following photographs are from the work of the team of Professor Catherine Petroff (Washington), Professor Patricio Catalan (Valparaiso), Thanassis Papadopoulos (Technical University of Crete) and Carl Eberling (Northwestern University). In our view, the tsunami forecast provided by NOAA’s Pacific Marine Environmental Laboratory was fairly accurate and timely. The final forecast was available at 5:51am PST (over 8 hrs before expected landfall in Hawaii) and showed that the main tsunami wave would had sneaked through Hawaii and the Marquesas and would had minimal impact in Hawaii. This forecast should had resulted in a cancellation of the large scale evacuation of all Hawaiian islands. Based on the early forecasts, only Hilo and Kahului should had been evacuated as they were, elsewhere, only the beaches. This was the advice of most scientists experienced with tsunami models and real time forecasts. We do not agree with the argument used to justify this overly conservative evacuation as “better safe than sorry”. If the sole purpose of tsunami forecasts and evacuations is to save lives, we should be evacuating after every large earthquake. The only purpose of the warning centers is to help differentiate between the earthquakes whose tsunamis are likely to cause deaths at specific locales versus those that are destined to miss populated areas, by interpreting the real time forecasts that are now available, and have been fairly routine for several years. Overly conservative evacuations erode the credibility of tsunami warning systems worldwide, particularly when accompanied by dangling and careless statements to the media about the veracity of the scientific models. The last time there was such an overly conservative evacuation of Hawaii in 1986, it cost the Hawaiian economy US$30Million. For the record, since 2006 NOAA-PMEL has this far issued five “correct” real time forecasts for farfield events without any even near misses. Why there was such a systems failure in the implementation of the forecast needs to be addressed. In the coming months, committees from the Department of Commerce and the National Research Council will be investigating the timeline and the reasoning behind this costly and unnecessary overly conservative evacuation.